Today, when you order "Mojo Grow Bag Kenton Knepper", you'll instantly be emailed a Penguin Magic gift certificate. You can spend it on anything you like at Penguin, just like cash. Just complete your order as normal, and within seconds you'll get an email with your gift certificate. 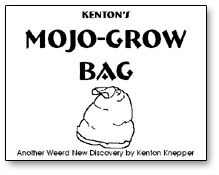 The performer displays a small (about 2.5 inches round) velour drawstring bag, which he claims is a Mojo Bag filled with "magic seeds." 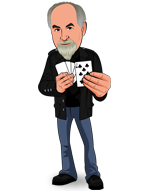 The magician dumps seeds out of the bag, which is seen to be empty otherwise. The seeds are placed into the bag and a spell is cast. The bag is opened and the performer removes a beautiful, fragile, paper flower, which nearly fills the little bag! "The seeds are growing" the performer says, as he removes five more flowers from inside! But - if that is not enough - the seeds are still growing other things! The audience sees that bag itself has grown and expanded into a very large 3.5 by 5.5-inch bag! It looks even bigger and can be entirely examined. Simple, unusual, charming, yet easy to do. Comes complete with Velour Bag, Six Paper Spring Flowers, Loads of Other Suggestions and Instructions.